Behold our door in all of its glory. Thanks to matt and kat for the idea and combined effort. 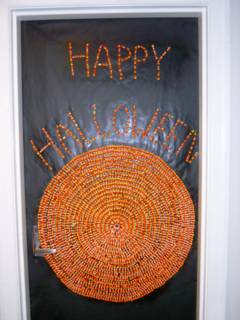 Yeah, an estimated 1000+ pieces of candy corn applied with hot glue guns. The dream of covering the entire door diminished as Halloween grew near. I can't tell you how many hours Matt put into this thing- more than he spent studying for his tests- that's fo' sure (certainly worth it though). I always knew candy corn was good for something.